The University of Wolverhampton’s new Science Centre has been officially opened. The £10.1m centre at the University of Wolverhampton Science Park was completed late last year and offers high quality workshop, office and category 1 and 2 laboratory space over 4,000 square metres. The centre, designed by Fairhurst Design Group and built by Clegg Construction, offers specialist space for science, technology and engineering businesses, catering for the aerospace, automotive, building technology and life science sectors. It has seven tenants so far including Crestwood Environmental, Deeo Design and Engineering, VOSC (Vehicle Occupant Safety Centre), Storm Gaming Technology, Aliksir, Rosendale Group and MSV Consulting with two more set to take up occupancy by the end of the year. 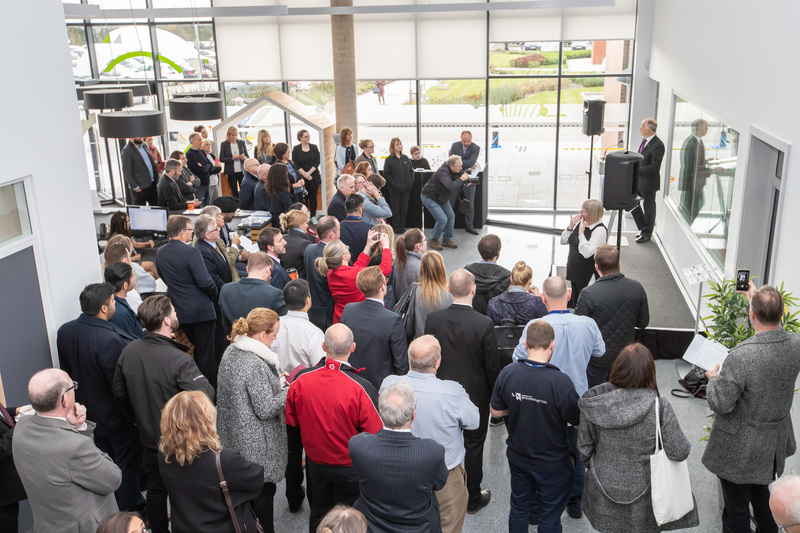 The opening took place as part of a Business Expo involving Science Park tenants showcasing their services on Wednesday 24 October 2018. Professor Ian Oakes, Deputy Vice-Chancellor at the University and Chief Executive of the Science Park, said: “We’re delighted to officially open the centre and celebrate it with tenants at the centre at the wider Science Park. “The Science Centre offers unrivalled space to businesses involved in science, technology and engineering and very much provides a step change in the type of facility available in Wolverhampton. Nigel Babb, University of Wolverhampton Science Park Commercial Director, said: “Since the building has opened we have had lots of interest in the space and are delighted with the companies that have taken up occupancy so far. The centre, which was named Best Large Commercial Building at the LABC West Midlands Excellence Awards earlier this year, was funded through a £4.8m grant from the Growth Deal to the Black Country Local Enterprise Partnership, with the remaining £5.3m coming from the University. For more information on the Science Centre and its facilities visit http://sciencetechcentre.co.uk/ or phone 01902 824000.